1. The first thing we did was paint the walls white. I didn’t want the blue wall color competing with the pink tile. It gave us a nice clean blank slate. 2. Next, we added extra lighting since it feels dark in there in the morning. If things aren’t functional it doesn’t matter if they are pretty. I found this vintage wall lamp at a old store and loved how it looked. It matches the chrome details of the bathroom. 3. Then we got a bunch of new fluffy towels. We are a white towel household. I love white towels because they look good and are actually easy to take care of. The only problem is we were getting towels mixed up in between showers. I’m willing to share a lot with my children, but not my towel! So I added metal hardware and name plates . That way everyone has a place to hang their towel. Our hand towels I keep rolled up in a basket. We got the fluffy new white towels from Target. 4. 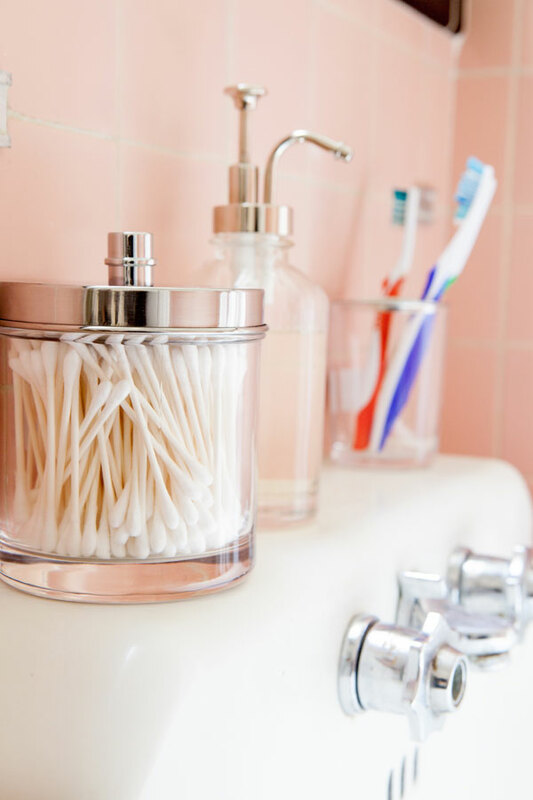 We got new bathroom accessories like toothbrush holders since ours were on their last leg and emptied our soap into the pretty chrome soap dispenser. 5. To finish, I always like to add a few sprigs of greenery. It’s an easy touch to make the bathroom look wild and fresh. Et voila! We got an easy bathroom makeover in less than a day. The extra lighting and new accessories and towels make such a big difference. It makes me wish we’d done it a year ago! We have a pink and black bathroom too. It needs updating BAD but I am thinking we should keep it and my husband and real estate agent think I am crazy. I might be but that is besides the point LOL. Good pointers I will keep these in mind. Thanks. I love the look. The pink seems so subtle when there is so much white added and looks cozy and warm. Love it! I lived in an Edwardian building in San Francisco for many years. I miss the charm and character. Don’t renovate! Your home is just lovely as it is. We have a vintage pink bathroom, too! It was high on my to-redo list when we bought this home…but we did other things and now I’m SO so glad we kept it. It’s grown on me and every morning it makes me happy. Once you remove those tiles you can’t get them back and a lot of people actually love them and it becomes a selling point for the home (to the right buyer). I hope you decide to leave it and keep us posted on how to freshen it up time to time. I actually like the pink! It reminds me of a mint and black bathroom my parents had when I was little. It’s kind of cute! Love the refresh but I wouldn’t have screwed hooks and nameplates into the tiles…you can never undo those holes now. The pink looks fine but I’m curious to know what larger renovations you have for the bathroom in the future. I love the pink! Big fan of white towels over here, too. We just moved into an early 1950s home with two bathrooms, one with mint green tiles and a pink tub, the other with grey tile with a pink tile border. We decided to embrace the pink tub and paint the walls an airy, light pink. I’m in love with the way it turned out. We also added yellow floral print towels from target, the whole room reminds me of a peony. As for the grey and pink bathroom we went with the lightest shade of grey we could find at Sherwin Williams. 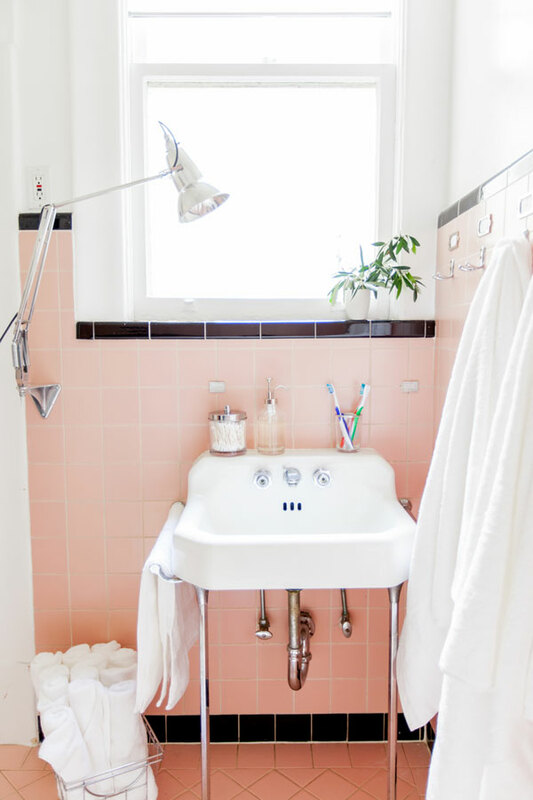 It compliments the grey tiles nicely, while brightening the small space and letting the pink tile shine. I can’t stand it when people tear out perfectly functional bathrooms and eliminate the vintage character. I wish we had the original sink, but the original faucet will have to do! I just looove pink bathrooms! I love how your skin looks in the mirror at a pink wall/pink tiles. Nice upgrade! I have the same 1950s sink in two of my three bathrooms, and though I find them aesthetically pleasing, the knobs are starting to corrode and I can’t figure out how to replace them. It looks like one site is selling reproductions which require a pretty substantial amount of work to swap out, but otherwise, nada. Are you planning to get rid of yours or renovate when you do your remodel? I’m dying to know what to do with it. Darling! I’d even question the need to renovate at all. This looks fantastic! NO!!! DO NOT RENOVATE IT!!! I LOVE IT! Save the pink! Even when older homes are embraced, the kitchens and baths are usually redone. It’s such a shame since they have such character and it’s especially tragic when they are original to the house. Thanks for showing a lovely update of your vintage bath. I like the pink. My daughters would love a pink bathroom. What kind of plant is that in your bathroom? We put a few olive branches in a vase. Thanks for proving that the bathroom does not have to be the ugliest room in the house! Going to file this post away for some much-need inspiration for decorating the space. Thanks for sharing! I love the pink bathroom. I have a vintage green one circa 1935. If we ever renovate I’m keeping it true to the original. So much charm. Check out these fabulous bathrooms on BHG that are remodeled to look original – pink and green versions! Inspiring. What do you do for a mirror in the bathroom? I love it!! I have a similar bathroom situation at my house, just with white tile. I similarly tried to give it a quick refresh since we won’t have the budget to renovate it for a while. Totally worth the day of work! Love the pink, but so confused about the light. Why do you have the cord going out the door? I love it. I’m having serious bathroom envy right now. That sink is one of my favorite bathroom sinks of all times. It seems it was the go-to sink of the era, but it has such great style… Nice refresh of a space that can typically get bogged down in the throes of real life. I am in LOVE with that pink tile. Our bathroom needs updating as well…a lot of the tiles are cracked. Hopefully I can get our landlord to actually budge and fix it! This looks great! I actually like the pink, haha. We had a pink bathroom in our old house but it wasn’t tiled and it was a more gaggy color. And we have the same soap dispenser! It looks so fresh and vintage and funky. Well done! where do you put all the stuff you use in the bathroom – soap, facewash, moisturiser? I live in Germany and all the post-1950’s bathrooms here have the wall jutting out from chest level out so you can put tubes and bottles on them as a sort-of built-in storage, but I’m trying to figure out how to keep it organised and have more plants in there. tips? you are not getting rid of the pink are you? that would be so sad! 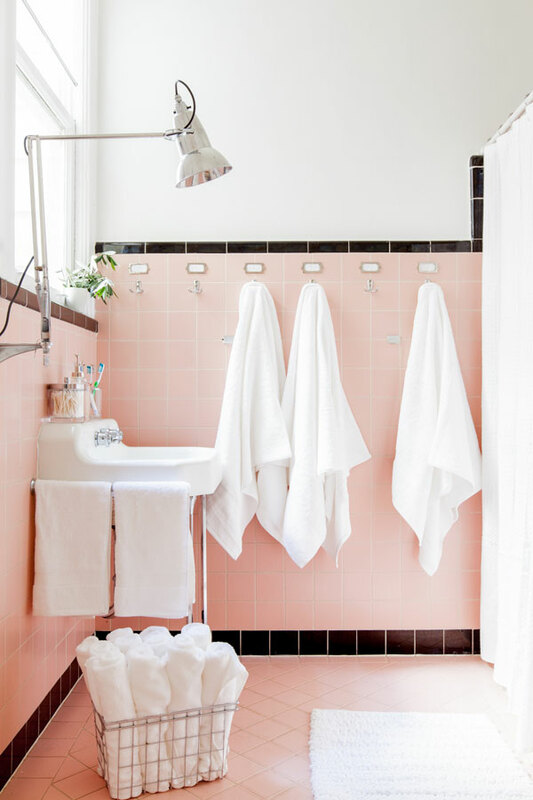 I would looooove a pink bathroom! Keep the pink! I love the bathroom, especially the hooks! I may do that in my new place to help save space! I have the tinest retro pink bathroom! Everyone loves it! It has a teeny tiny sink and the original toilet. I have had ideas of turning it into a pantry since it right next to the kitchen but so many people love it that I’m just going to keep it. I think I’ll add a white hand towel and call it a day! Wish I hadn’t completely redone my bathroom. Some things are meant to keep their art deco charm! I love this bathroom…..we had the exact same tile in a rental that we lived in years ago. I painted the upper walls a soft, soft pink, put frilly curtains and shower curtain in there, put a small aquarium with pink and black gravel and black goldfish! It was the favorite room in the house of most people who visited. But I really love what you did….it brings the vintage flair back. Don’t change it!!! 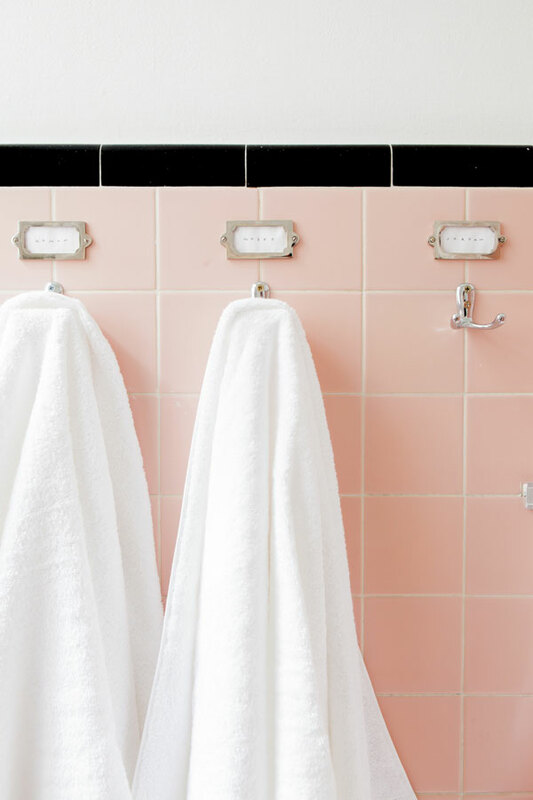 Any tips for keeping your towels and bathroom items pearly white? Love this fresh look and pretty much everything you put your hands on. You are so great!